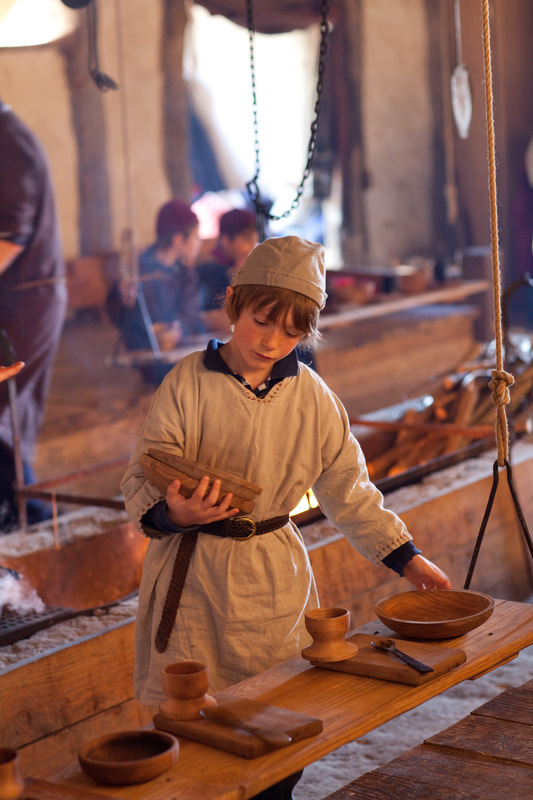 The Role of Fundamental Education in the Heritage Industry - As the manager of the Ancient Technology Centre (ATC) in Dorset, England, like many of you, I consider regularly what it is that we actually do. What services do we provide? How are we regarded by the public, by the education sector, by the children we teach, and by those who pay to come through our doors. At face value, the question is simple—are we part of a Heritage Industry, or on the periphery of formal education systems? We are ‘fun’, ‘interesting’, ‘a good day out’, ‘fascinating’ and yes, let’s be frank, a bit ‘weird’—in the eyes of some, we ‘play with the past’. One of the main weapons in the ongoing struggle to limit the experiential learning of our children is a common misconception of Health and Safety. The many thousands of visitors to the ATC often remark on, and question our ability to duck under or avoid the modern fixation with Health and Safety. The truth of it is far subtler and reflects our own conviction in the right of children to explore their environment, neither does it at any point avoid our responsibility as educators and carers of children. We are the people who make history and archaeology ‘cool’—who make it accessible to those many people who have an interest in who we are as humans, where we came from, how we got here, what the journey was like. We take those small pieces of evidence from the archaeological record and try to re-create long forgotten worlds. We might consider ourselves either serious archaeologists or keen amateurs, but we are all striving for a “truth” that academic inquiry rarely attains—a truth of the past that only comes from ‘doing’ or ‘living’ it. Over the last six years, local government has faced serious funding cuts from central government as a direct result of the global financial crisis. Inevitably, any non-statutory elements of county councils have faced severe or total funding cuts. Even before this squeeze on outdoor education, we at the ATC, in line with the rest of the Dorset County Council (DCC) Outdoor Education Service, were well aware that our imperative was to become financially sustainable. In the last five years, our subsidy from DCC has been reduced to zero. We expect over the next three years to work towards a financial surplus in order to provide a financial buffer against potential future funding threats. The question is increasingly asked of us: “what do you do?”The obvious answer is Experimental and Experiential Archaeology. We, like all archaeologists, attempt to draw together the threads of evidence that survive the ravages of time and seek to create a fuller picture of our past. I have likened that process to shutting someone in a room with a 10,000 piece jigsaw puzzle—with no picture and then turning the lights off! There is, however, another side to what we do, beyond the world of reconstruction and historic interpretation. This other side has made itself apparent to me over the last 13 years during my efforts to make the past accessible to children and the visiting public alike. This other side concerns the reality of modern education and the way that our children are now expected to learn. It concerns not only our distant past, but also our future and how we enable the next generations to access their world in an informative, inquisitive, practical, authentic and imaginative way. Schools and parents—what they provide and what they do not! The increasing emphasis on academic attainment at an earlier and earlier age in our schools, combined with the rapidly changing lifestyles of the average family, is producing children and adults who are increasingly segregated from the world around them. In my opinion this combined with a false notion of Health and Safety as an inevitable inhibitor of fun and creative activities, has already produced a generation of children who spend more time sitting in front of screens than playing outside in the street or their local environment. It is a sad truth that to many in our modern world, my own exploits as a child growing up in the industrial periphery of Sheffield in the 1970s, building fires, making dens, using and owning knives, exploring my surroundings with groups of friends, and without the direct supervision of an adult, would be seen in many parts of the modern world more in terms of delinquency than education. This “criminalisation of natural play” (Louv, 2008) is responsible for pushing once acceptable behaviours beyond the pale. And yet, it is those same people, people who had very similar experiences as myself as children, who are now responsible for the implementation of educational frameworks that effectively over-protect or shield our own children against their learning environments to a degree that seriously constrains the fundamental educational development of our children. As Adams (2003) asserts, no natural environment is completely free from risk either. These risks are a fundamental part of childhood, in that by gradually learning what is safe and what is dangerous, especially with regard to their own actions and behaviours, children develop their own ‘risk thermostat’. In our current educational climate, the majority of children simply have no risk thermostat, and more often than not, are not permitted to acquire one. The same can be said of fundamental knowledge and how it is acquired. In a world where a family can walk past an entire supermarket isle of neatly packaged meat without a single pictorial reference to the animals that produced it, is it so surprising that those same children have no concept that bacon is part of a pig, that fish fingers are actually made from fish or that leather is the skin of an animal? Our daily teaching at the ATC has enabled us to keep a rough eye on the changing knowledge of the children we teach, and it is nothing but shocking to realise that of a class of 30 children from urban or rural backgrounds, 20 to 25 will have no idea that leather is the skin of an animal. The same number will have wildly inaccurate estimates (ranging from three weeks to five years) regarding the time it takes for wheat to grow to harvest. Five or more of those children will have never had seen a real flame. What has become apparent to us is the depth of this issue. I have personally witnessed the incredulity of 7 to 9 year olds as they discover they are wearing animal skin on their feet (shoes), only to see their parents sitting behind them react with equal incredulity! The situation is desperate. The shift in education policy away from experiential learning to a more rigorous didactic learning model, combined with parenting hampered by rumoured Health and Safety restrictions, has created a gulf in the exposure of children to essential and basic knowledge regarding the world around them. I see the role of non-statutory educational establishments such as the ATC as holding crucial positions in the vanguard of a small movement to correct this lack of fundamental learning. By considering such questions as “where do ‘things’ come from”, “what does it take to produce a wholesome meal from scratch”, our aim is to connect a disconnected generation with those processes that are intentionally or otherwise hidden from them, to engage them in the production of simple things using simple and traditional methods that are grounded in the local landscape and the seasonal materials it produces. At the ATC, Fundamental Learning covers any activity that is purposeful, contributes to an understanding of the world around us, now or in the past, includes processes and is therefore real. This archaeologically authentic outdoor education model ensures that children learn more and learn better, and as Dillon (2005, 27) recognises, they also learn differently, experiencing improvements in four specific ways: Cognitive Impacts (greater knowledge and understanding) , Affective Impacts (attitudes, values, beliefs and self-perceptions), Interpersonal and Social Impacts (communication skills, leadership and teamwork), Physical and Behavioural Impacts (fitness, personal behaviours and social actions). In my experience it is unfortunate and sadly true that Health and Safety is more often used as an excuse to not do something—Health and Safety used in this context replaces the phrase “I can’t be bothered” or “I don’t want to do that”. People with the best of intentions cite Health and Safety as a reason for not doing something or for not allowing others to do something, without any foundation in fact or law, and this rapidly takes on a mythical status which, in turn, unintentionally curtails the potential for exciting and genuine learning. This Health and Safety rumour begins with what is considered to be children’s best interests in mind, the effect is nothing but misguided. If children aren’t supervised by a ‘responsible’ adult in everything they do, we as parents are frowned upon by others, considered uncaring or downright neglecting of our children’s welfare. It is exactly this suffocation of our children’s potential experiences that ensure their segregation from their own environment and their ability to explore it in their own inquisitive way. At the ATC our approach is simple and tackles this issue head on. Rather than saying “we can’t cast bronze with 7 year olds—Health and Safety” we simply turn it on its head, and instead ask, “How can we cast bronze with 7 year olds safely”? 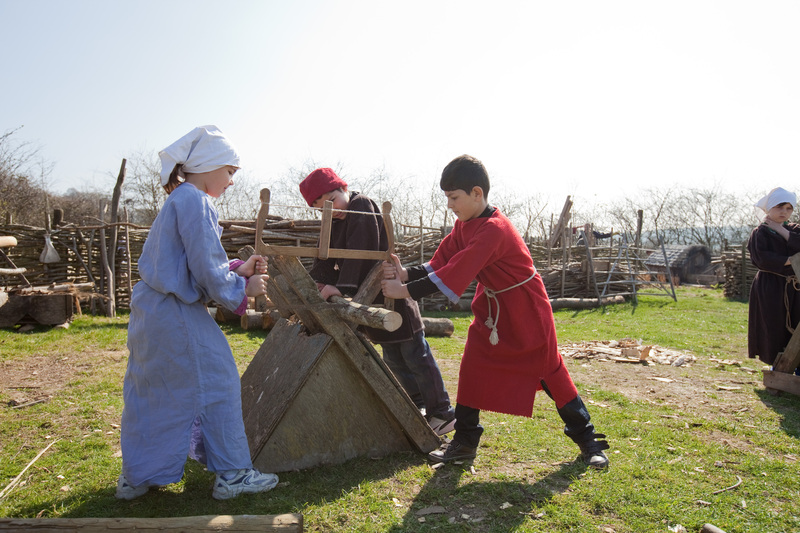 Using this simple approach, we have been able to develop many activities, such as felling trees with flint axes, moving and raising 1.5 tonne monoliths, blacksmithing, that most people would deem too dangerous for children to undertake. Our safety record is outstanding and our systems ensure that each new activity is developed with children in mind. Modifications in the execution, such as changing the tool size and inclusion of Personal Protective Equipment where identified by our thorough risk assessment procedures, while keeping sight of the goal, is to explore the realities of the past using all of their senses. This directly challenges the notion of risk free learning environments as nothing but misguided. We place emphasis on the children themselves taking responsibility for their own actions. They are, after all, not merely sheep to be herded from one thing to another. We teach them a safe method, and critically tell them what can happen if they misuse tools or do not follow the processes (in all of its gory detail!). We expect them to act accordingly, fully aware that they themselves, in the end, are the masters of their own safety. This, of course, requires trust, excellent systems and teaching, and a comprehensive Health and Safety framework. "It is now acknowledged that exposure to well managed risks helps children learn important life skills including how to manage risks for themselves” (Ofsted 2008, 20). The process is simple and very effective but requires the commitment of staff to pursue it, often in the face of raised eyebrows from certain portions of society. The benefits of this authentic educational style are clear. “Children who learn outdoors know more, understand more, feel better, behave better, work more cooperatively and are physically healthier. Not a bad result from simply changing the location where they are being taught. Importantly, this is not just for able and motivated pupils: under-achievers also do better in a natural environment, especially when exposed to high-quality, stimulating activities” (National Trust 2012, 9). Our belief in a genuinely ‘hands on’ education is increasingly supported by a growing raft of research from organisations such as the Council for Learning Outside the Classroom. This style of education is one in which the subject matter can be touched, felt and smelled. It creates a climate of possibilities, an energy from staff, volunteers and children alike. The positive energy of performing tasks for the first (and often only) time that reveals the truth of their world to them is astounding. To see the realisation and wonder on a 7 year old’s face as she successfully and safely moves a 1.5 (weight unit?) boulder from one end of the site to the other with her friends, is marvellous. The context it provides for future visits to monuments or a glimpse of ancient structures on television, and the understanding of positive human potential it creates, are all tremendous outcomes of doing something real. These experiences give our children and visitors powerful weapons of understanding in their long road through life. It enables them and gives them confidence to question the invisible processes that lie behind their own visible world and, of course, it puts them in the same mental place as the countless ancestors who experienced the same tasks. In the current financial climate, the temptation is to shrink, curtail non-essential work, cut loose those things that require effort and, in simple terms, go for the money. At the ATC, we have reacted in another way, to re-focus on the quality of what we provide and to build on our uniqueness, to recognise our strength in this educational field, and to broadcast that strength to schools and visitors. We continue to put our effort into the provision of unforgettable educational experiences. So what do we do? Well, like many others in the field, we attempt to shed light on the past through the act of doing. 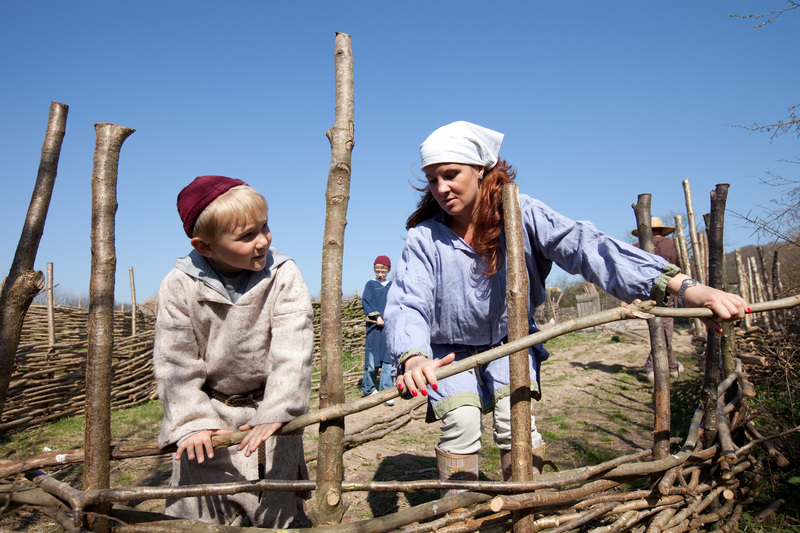 We run long-term construction experiments and, on the face of it, we let children explore practical aspects of life in the past. In doing so, we challenge their own and our own insights and assumptions concerning our distant ancestors. During this obvious educational process, we fulfil the increasingly critical and less obvious role of enabling children and the public to experience the real world around them. We are not a luxury, a cherry on top of a comprehensive education cake. We are the sponge, the foundation of those other educational elements. Without our essential and fundamental approach, other learning is without context and without reference in the real world. So in the end, perhaps we are playing with the past and saving our future. And the next time someone suggests to you that what we do is nothing but fun, look them in the eye and tell them what we do. ADAMS, J. 2003. Risk and morality: three framing devices. In (eds.) Ericson, R.V. and Doyle, A. Risk and Morality. University of Toronto Press. DILLON, J., Morris, M., O’Donnell, L., Reid, A., Rickinson, M. and Scott, W. 2005. Engaging and Learning with the Outdoors. National Foundation for Educational Research. LOUV, R. 2008. Last Child in the Woods: Saving our children from Nature Deficit Disorder. Algonquin Books. Ofsted(2008) Learning outside the classroom: how far should you go? Manchester: Office for Standards in Education, Children’s Services and Skills.